The development of multifunctional nano-materials from the controlled assembly of responsive (block) copolymers requires a high level of control over the molecular structure of the building blocks. In order to transfer a specific functionality from the individual responsive groups to the final material, tailormade block copolymers with complex architectures must be developed. 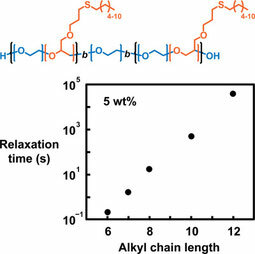 However, the preparation of such multifunctional block copolymers represents a challenge to polymer chemistry since it often requires the combination of different polymerization methods. These not only have to give access to well defined polymeric architectures but also have to be compatible with the respective functional groups that are implemented to provide the materials final properties. To address this challenge, we are focusing on the development of new robust synthetic pathways by transferring synthetic concepts from modern organic chemistry to the field of polymer synthesis. 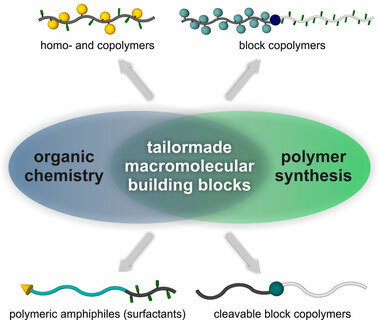 As shown in the Figure, this interdisciplinary approach gives access to multifunctional polymers and block copolymers of complex architectures. 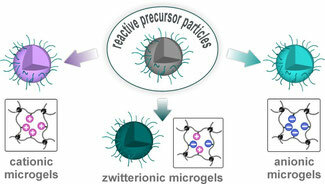 In the Klinger Lab, we especially concentrate on the development of new reactive precursor polymers that reveal the responsive moieties via a post-polymerization approach. The main challenge in this concept is the development of orthogonal reactivities that enable multiple functionalizations in specific locations.